The opportunity and support to try new tech & practices mean California farmers can keep growing the produce that feeds the nation. In California’s Pajaro and Salinas Valleys, aquifers are it. With almost no surface water coming to the Central Coast from further upstream, the region depends entirely on dwindling groundwater. As local aquifer levels go down, the space left behind draws seawater into the fresh water supply. Nutrients from fertilizer also make their way into the water below fields, affecting the quality of drinking and irrigation water. We’ve been working with the RCD of Santa Cruz County, the RCD of Monterey County and farmers on the Central Coast to help them maximize their “crop per drop” for several years, and now we’re excited to announce a partnership with FarmLink, a lender that helps local farmers by linking them with land and financing. 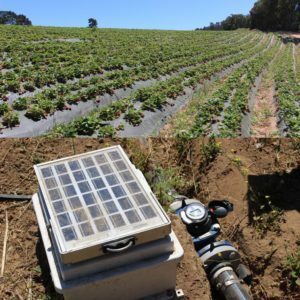 Growers who participate in the program and demonstrate water and fertilizer savings using the metrics, monitoring and technical assistance program we’ve developed are eligible for a loan rebate at the end of the growing season. We recently travelled to the Pajaro Valley to talk to some of the farmers who’re participating in the inaugural year of FarmLink’s loan rebate program. 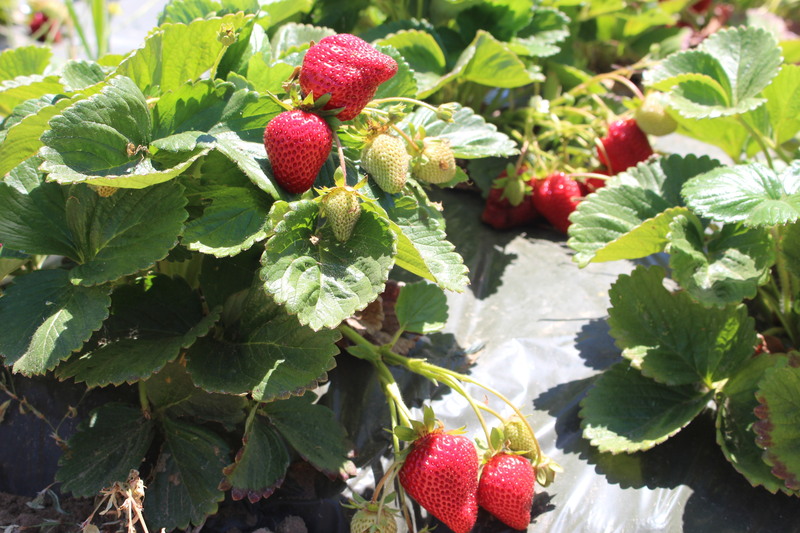 We visited their farms and learned about how and why they grow strawberries, and how saving water and fertilizer can add up to a bigger solution. Every farmer’s story is unique, but every person who tends the land has something in common. For Rafael García, Ruben Ponce and Juan Vergara, that shared thing is their pride in what they do. Pictured: Sr. Manager of Conservation Incentives Kelli McCune discusses water use with Rafael (middle) and Sacha Lozano of the RCD of Santa Cruz County (left). Rafael enjoys watching seeds grow as a gift from nature and giving a better and healthier lifestyle to his family. 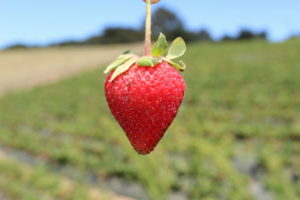 He’s participated in many different roles, from picking berries when he came to California in 1997 to assisting farm managers, selling at farmers’ markets and establishing a business partnership with two other local growers. Now, he’s farming strawberries that he sells in farmers’ markets across the Bay Area, and looking to expand. Ruben still loves farming after almost 70 years of experience growing produce, from his childhood in Mexico to the hillside bounty he tends now. It’s what he knows, and what drives him every day. When he’s not in his fields irrigating, weeding, fertilizing, harvesting or maintaining his equipment, he’s at the local markets selling delicious vegetables and berries. Juan makes a critical connection: without farming, there’s no food. He sees what he does as a service to others that also fulfills him and helps him provide for his family. In partnership with his father, he started a single acre operation in 2013 that’s grown quickly, and is interested in expanding while promoting organic practices. 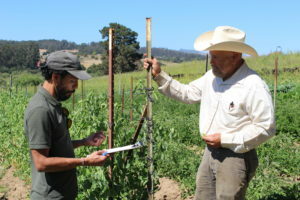 Pictured: Sacha Lozano and Ruben (right) talk about how Ruben manages his water use on his hillside acreage. They also share important concerns about their farms’ health and longevity. Maintaining the highest quality produce while considering needs like labor, water, new equipment and the ever-present drive to expand and diversify their enterprises is a challenge. To meet these challenges, all three growers focus on learning and growth through improving their practices. For Juan, the technical assistance and support the RCD provides in using the efficiency metrics help him produce better culinary herbs that make his clients happy. Rafael cites the opportunity to gain tools that’ll help him better manage his crops while conserving water. And for Ruben, it’s about learning and trying new things on his farm every day. As for the incentive, it’s a much-appreciated and needed financial boost to support their businesses’ viability. The business and practice of agriculture are vital, and difficult. Nourishing the nation takes dedication and hard-won stability to weather the uncertainties of climate, regulations and marketplace changes. Making changes on the farm to help ease the strain on local resources requires flexibility and a willingness to experiment that’s often predicated on this stability. Without capital and the right tools, innovation simply isn’t possible. Without innovation, our resources remain at risk, and our communities can’t thrive. People drive the innovation behind the delicious produce we eat – together, we can build water security for the future. It means going further to help current and next-generation farmers access the capital they need to keep their farms productive and their businesses viable. It means farmers like Rafael, Ruben and Juan can keep building successful farms, protecting their local water supplies and providing for their families. It means building a powerful model for an incentive that could scale to larger lenders across California. 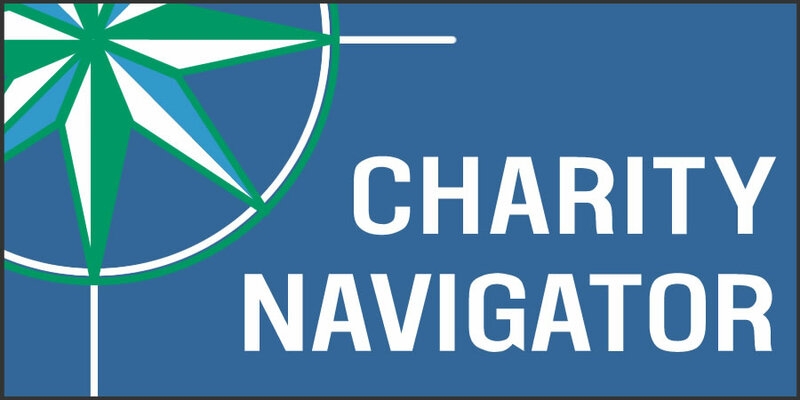 It means linking what’s good for people to what’s good for the environment in ways that help us build lasting partnerships, drive economic growth and innovate, together.